What’s a Reverse Osmosis System? If you’re a regular reader of the Quality Water Services blog, you know the importance of providing the purest possible water to your family. You also know that there’s more to clean water than just the stuff that you drink because water touches almost every part of our daily lives, including showering, cooking and washing clothes and dishes. The situation can get even more complicated when there’s an individual in the house who suffers from immune system issues like those on dialysis or undergoing cancer treatment. Two of the most popular water-purification systems are water softeners and reverse osmosis systems. While many people have heard of soft water, reverse osmosis sounds like something you’d find under the hood of Doc Brown’s DeLorean. This week, we’re talking about what they do and how they help provide cleaner water for your daily use. Osmosis is actually a naturally occurring phenomenon, maybe you remember hearing about it in a science when you were younger. Typically, you hear about it in relation to the way blood cells gain water. It’s the process by which molecules of a solvent (usually water molecules) pass through a semipermeable membrane (usually a cell membrane) to equalize the concentration of molecules on both sides. In layman’s terms, it’s the movement of water through a membrane to equalize the concentration of particles on both sides. Think about what would happen if you poked small holes in a plastic bowl filled with dirty water then placed it in a kiddie pool full of clean water. Eventually, the dirty water and clean water would mix together to create a slightly dirty kiddie pool. That’s how osmosis works. Reverse osmosis, then, works in the opposite way. The system removes water impurities by pushing it through a semipermeable membrane. Using a high-pressure pump, reverse osmosis systems increase the pressure on the impure side of the system (standard water) and pushes it through a membrane, trapping almost all dissolved salts, organic materials, bacteria and pyrogens. All the leftover materials are then discharged through a reject stream attached to the system. How can a reverse osmosis system benefit me? The CDC’s information on water treatment for household use outlines a few of the benefits of reverse osmosis systems. They report high effectiveness in removing protozoa (like Giardia), bacteria (like Salmonella and E. coli), viruses (like Norovirus and Rotavirus) and other chemical contaminants. Multiple expert estimates state 92­–99% of salt, lead, arsenic, copper, nitrates, nitrites, chromium, selenium, fluoride, radium and barium can be removed from water by using a reverse osmosis system. The most noticeable benefit of installing a reverse osmosis system is great-tasting water. You’ll also find that coffee, tea and other drinks taste better with cleaner water. Similarly, the food you make may taste different. Because many water systems use chlorine in their treatment process, that flavor can affect the taste of the food you make. Removing that chlorine using reverse osmosis could help the flavors in your food. Reverse osmosis systems can also be used in conjunction with soft water systems to remove the excess salt they use for filtration. Plus, because these systems are usually small and use very little energy, you’ll hardly even notice it’s there. The only aspect of reverse osmosis systems which can be considered a downside is that they might filter out too many minerals. For example, the fluoride often added to water systems to help strengthen teeth and fight tooth decay is mostly filtered out through reverse osmosis systems. Luckily, most people aren’t relying on their water supply to provide the necessary minerals for their bodies. Those minerals typically come from the food you consume, but if you’re worried about your mineral intake with a reverse osmosis system you can always take a mineral supplement. The benefits, in our opinion, far outweigh the consequences when it comes to these systems. 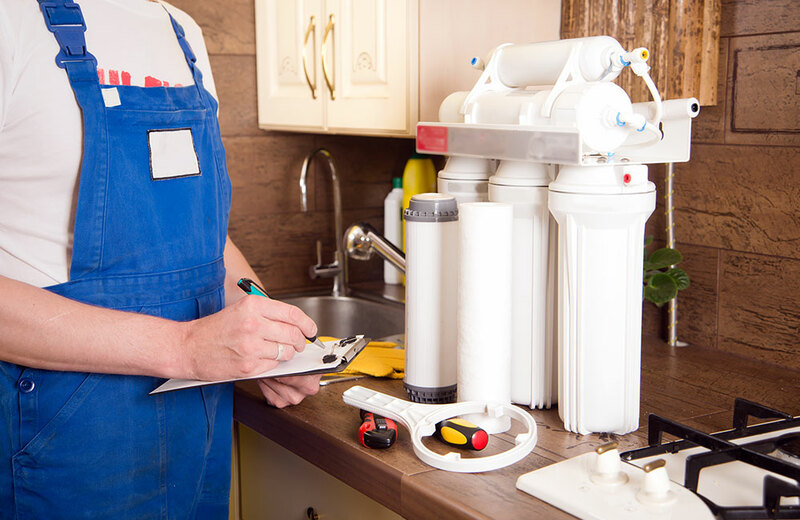 If you think a reverse osmosis system would be a good fit for your home, give QWS a call. We’d be happy to outfit your home with a system to get you and your family the clean, quality water you deserve!